14 APR - CBC PREMIER - Gibbons treble as Sportsman win to finish fifth, whilst Intake sign out with defeat - Norton Sportsman won at Handsworth Old Crown with the help of a Michael Gibbons hat-trick to finish a very creditable fifth in their first season in the top flight, whilst the already relegated Intake Old Boys signed out of the CBC Premier with a home defeat by Oughtibridge WM. 14 APR - DIVISION 1 - Forum make sure the title will go to the final game - Forum (left) drew their final game of the season at fourth place Cotts to regain top spot in Division One meaning that Royal Earl must avoid defeat in their final game of the season next weekend to pip Forum to the title. 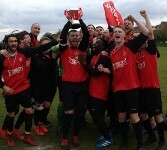 Crookes made sure that goal difference didn't come into the equation for third place with victory over Southey Social in their final game of the season, whilst Cobden View made fifth place theirs with victory at Mosborough Reds. Defeat in their final game of the season at Civil Sports A meant that Norton Oaks B failed to overtake Oaks A side. 14 APR - DIVISION 2 - Boynton take the title, whilst Colley clinch fourth place - Leaders Boynton Sports (right) beat second place Sheffield Sixs to clinch the Division Two title. Sixs still held on to second place though and third place Mosborough Whites also slipped to a rare defeat at Shakey. Colley clinched fourth place with a draw at the only team that could overtake them, Woodhouse Juniors. 8 APR - The FA Grassroots Football Awards 2019 - The FA Grassroots Football Awards 2019 The FA and McDonald’s Grassroots Football Awards 2019 are now open for nominations. The nomination window will be open until 10th May. There are 10 categories available for individuals to nominate. 29 MARCH - Sin Bin Training - Please see below, detail of Sin Bin training courses to be run by the County FA, including one at Ice Sheffield next Wednesday 3 April. You have to book a place in order to attend and we strongly recommend that you get someone from your club to attend. SENT TO ALL LEAGUES & DISTRICT FA’s The County FA has now finalised a list of workshops which are available to support peoples’ knowledge around Temporary Dismissals (sin bins) which is coming into effect from the 2019-20 season for all grassroots football (this includes mini-soccer and youth football, men’s football (from Step 5 and below) and women’s football (Step level TBC). Attendance at workshops is via registration only, through the relevant booking link on the County FA website - http://www.sheffieldfa.com/news/2019/mar/20/sin-bin-workshops They do not plan on running additional workshops but will have a recorded presentation available for anyone who is unable to attend a workshop. Should you have any questions about any of the above information, please don’t hesitate to get in touch. 22 MARCH - Fixtures and Referees for APRIL 2019 now added - The Fixtures and Referees for APRIL have now been added to the website. Home clubs should contact their opponents and Referees where shown ASAP. 30 AUG 2016 - Twentytwo and Sheffield Trophy Centre sponsorships with the League - We are pleased to say that football shop twentytwo have extended their sponsorship of the League by becoming the new sponsor of the League Cup, which will now be known as the League twenttwo Cup. 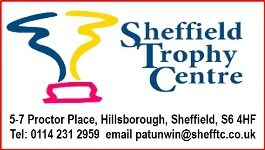 The League's Leading Scorer Award for the League's Overall Leading Scorer in league games will now be sponsored by the Sheffield Trophy Centre, with the winner receiving a Golden Boot Trophy. 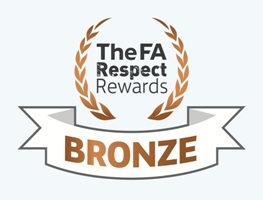 25 August 2014 - Blades Super Draw League again honoured by The FA - The Blades Super Draw League's hard work towards the aims of The FA's Respect campaign over many years has again been recognised with a second award in three years by The FA. Following on from a Bronze Award three years ago, the League has received a Commended Award for its work last season. It's a great honour to be recognised in this way and it recognises the hard work the League continues to do to make its games enjoyable for all concerned. 19 Apr 2012 - Blades Super Draw League honoured by The FA - The Blades Super Draw League's hard work towards the aims of The FA's Respect campaign over many years has been honoured by The FA with a Bronze Award. For 25 years the League's Merit Award system, culminates in the Steve Gee Merit Cup Final each season. The system, which rewards clubs for good behaviour and good discipline throughout the season, was a key element. The League was also the first Adult Men's Sunday League in the Sheffield & Hallamshire County FA area to adopt The FA's Respect banner. We have continued our efforts to make the League one of the best, if not the best, in the country by refunding a portion of League fees back to the top five clubs in terms of discipline. The aim is to make our games enjoyable for players officials and spectators alike and we intend to try to continue to find ways of furthering our principles. All the people that have contributed over the years should be very proud and our clubs should also be very proud of the way that they have helped by adopting the principles set out by the League. Support for the Spartans 2009 - The Blades Super Draw League is helping to promote the Spartans FC - a Sheffield area Special Olympics football initiative - and Spartans FC now has its own web page which you can access by clicking on the Spartans FC icon above. Watch out for updates. See History for last season's Roll of Honour and honours winners since the League began.